Yes, it’s almost here. The start of Marvel’s Phase III saga in their cinematic universe is about to begin very soon, beginning with Captain America: Civil War. With a lot of inherit hype to the project, expectations for this movie are through the roof. That being said, before venturing off to see Civil War and declaring your side (Captain America or Iron Man), let’s go back and review Steve Roger’s first cinematic adventure (before he became “the man out of time”) with the movie Captain America: The First Avenger. Was it a Marvel origin story worth doing or what is a hodgepodge of being superhero aesthetics with a WWII backdrop? In 1942, the United States has entered the fray of World War II. Sickly and scrawny, but determined to prove his worth, Steve Rogers (Chris Evans) is frustrated at being rejected (several times) for military service against Hitler and his Nazis as he watches other join in the fight, including best friend Bucky Barnes (Sebastian Stan). Enter Dr. Erskine (Stanley Tucci), who recruits Rogers to participate in a secret military project titled “Project Rebirth”. Proving his gifted abilities beyond the physical (courage, wits, and conscience) to Colonel Phillips (Tommy Lee Jones), Rogers is chosen for Erskine’s experiment, transforming his weak and frail body to a super enhanced human and gifted with maximum human potential. When Dr. Erskine’s is assassinated by an agent of the Hydra, a deep science research division of the Nazis party (headed by Johann Schmidt aka the Red Skull (Hugo Weaving), Rogers is left as a unique individual (the world first “super soldier”, who is initially misused as prop for propaganda. 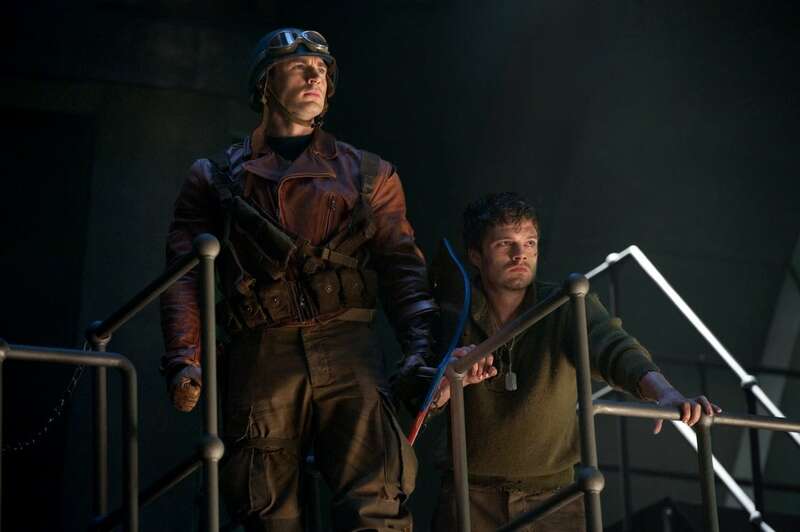 However, upon hearing of Bucky’s capture by Hydra, Roger heeds the call to action, joining up with Peggy Carter (Haley Atwell) and a ragtag bunch (forming the howling commandos) as the fight against Hydra’s forces, while the Red Skull and Dr. Armin Zola (Toby Jones) secretly harness the power of a mysterious ancient artifact. This is interesting to do this movie review post because it is my first “retroactive” post. Meaning that, I’ve seeing Captain America: The First Avenger when it first came out, but that was before I started blogging. Since then, of course, I’ve seen Captain America: The Winter Soldier, its intended sequel, and I’m looking forward towards its third (and supposedly final cinematic installment) in Captain America: Civil War. So this will be interesting to do. This is a first for me ladies and gentlemen. Director Joe Johnston, who previous directed Hidalgo, The Wolfman, and Jurassic Park III, helms this marvel film project. Johnston has a unique task when crafting The First Avenger, one that fuses superhero flair in a WWII setting. To its effect, it does work. The backdrop setting of 1942 feels historically accurate with appropriate look and feel that doesn’t feel out of place. So while the setting feels authentic in a WWII motif, its marriage with the superhero genre works, playing with the elements that are now commonplace in superhero movies as well as establishing itself as origin story for Captain America. Screenplay writers Stephen McFeely and Christopher Markus shape the story of Steve Roger’s transformation from “zero to hero” with enough emphasis and emotional investment in its story that it feels genuine, with moving moments and stirring passion of inspiration (one befitting a character of Captain America). Even the heroic journey against the Red Skull, The First Avenger is tightly paced with enough action, humor, and comic-book thrills to create a satisfying feature film from start to finish. As a side-note, I do like how the movie opens (set during present day) as they find remains of Hydra plane and first glimpse Cap’s shield. Good intro. There are some problems with The First Avenger, some noticeable, while others minuscule. First, the movie has some broad strokes to its narrative. It’s not all the time, but it feels like there could’ve been more to the adventure that was shown (especially within the middle act’s montage reel). Next, some scenes in particular are a little bit hokey and kind of don’t fit, offering up cheesy lines of dialogue and awkward storytelling. On the other hand, this plays up the wholesome spirit of Captain America as an unsung war hero / superhero. In an age of superhero movies that try to make a darker and grizzly reimagining of the story / heroes, it’s kind of refreshing that The First Avenger doesn’t do that, retaining the inspirational and unabashedly patriotic punch to the character of Steve’s Roger. Lastly, while I did mention that movie has superhero action, it just doesn’t have that spectacular “wow” factor. Even the movie’s final battle, while well executed and edited properly, it doesn’t have that incredible punch to be blown away by. Naturally, to incorporate the superhero’s aesthetics, visual effects are needed for The First Avenger. Compared to recent Marvel movies (Avengers: Age of Ultron, Guardians of the Galaxy, etc. ), these shots are dated. Still, for their time, they were good and were up to date with current level of quality CGI rendered shots. I do have to say that the visuals for the first iteration of Steve Rogers (the scrawny, weaker one) is a little bit jarring at first, especially since it looks like they stuck Chris Evans head on a 12-year-old body. The camera work for the movie was pretty good (thanks to cinematographer Shelley Johnson) with little to none of the “shaky” cam effect, creating smooth looking feature. Additionally, the music score for The First Avenger (composed by Alan Silvestri) is actually pretty good, with plenty of dramatic poise and heroic patrotic flurries. Again, for its time, The First Avengers had (collectively) a diverse cast of actors employed for characters. Actor Chris Evans, who has already played a Marvel superhero with his role as Johnny Storm aka “the Human Torch” in Fantastic Four and Fantastic Four: Rise of the Silver Surfer, leaves the persona behind and completely owning the role of Steve Rogers. Evans finds the humanity in Rogers, tasking the irony of the dichotomy between inner and outer strength with a well-balance of believability. Even as Captain America, Evans looks the part of a hero (tall and striking) and handles the action scenes well, but it’s more of the dramatic ones that resonate with him the most (especially since this is an origin story). Since then, Evans has grown and mature (both as actor / director), but also has the character of Captain America, proving to be the stalwart and courageous leader of the Avengers team up movies as well as growing more of his character within the persona of Steve Rogers in The Winter Soldier. Will more be explored in Civil War? I’m sure it will be. While Evan’s embodies the film’s protagonist, actor Hugo Weaving embodies the film’s antagonist as the Red Skull. Weaving’s acting ability helps manifest the villainy in the character and doesn’t overdo it so much he become a cartoonish. Even when all the red makeup is on, the character of the Red Skull is a great villain (shame that he hasn’t returned yet to the MCU. Hopefully he does). Haley Atwell shines as the bright and tough-as-nails Allied operative Agent Peggy Carter, who also acts as the love interest for Steve Rogers. It also helps that both Evans and Atwell look good together and have an understated chemistry with each other. It’s not over-the-top chemistry, but its subtle enough that it works effectively and with enough sincerity to back it. Acting as the best friend / sidekick, Sebastian Stan introduces us to the character of Bucky Barnes, with enough brotherly / best friend swagger to him and to the relationship he has with Rogers (Hint: The Winter Soldier and Civil War). In more supporting roles are Tommy Lee Jones, Stanley Tucci, and Toby Jones, respectfully as Colonel Phillips, Dr. Erskine, and Dr. Armin Zola. Jones’s Philips steals many scenes with some dry humor that only Jones could off, while Tucci’s adds some weight (and a little bit of humor to his character of Erskine. Jones’s Zola has his moments, I kind of felt he was shortchanged a bit, acting more as a henchman to the Red Skull. 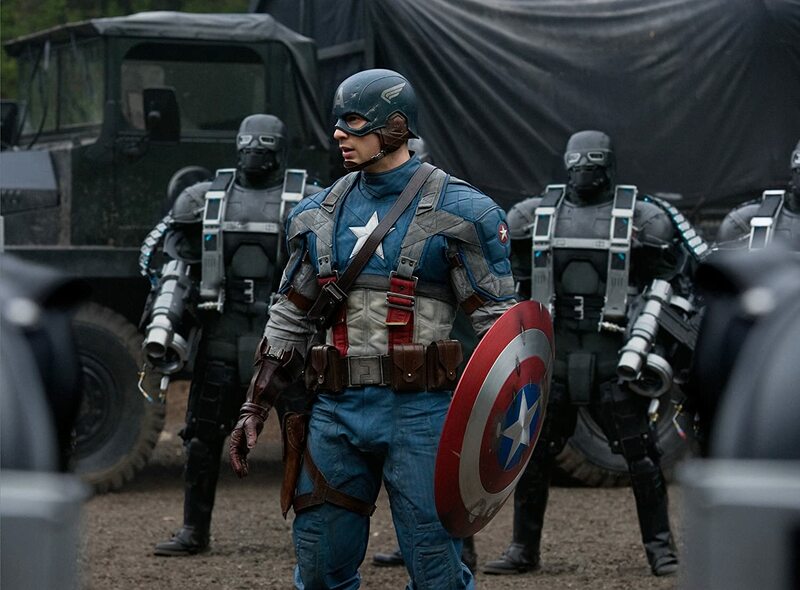 Then there are the collective group of actors who make of Cap’s “Howling Commandos”, including Neal McDonough as Timothy “Dum Dum” Dugan, Derek Luke as Gabe Jones, Bruno Ricci as Jacques Dernier, and JJ Feild as James Montgomery Falsworth, and Kenneth Choi as Jim Morita. Like Jones’s Zola, these individuals are more supporting players in the movie’s grand scheme of things, but they do get their moments in the spotlight and are collectively a solid group of characters / actors together. Forgot to mention Dominic Cooper’s small / cameo appearance as the younger version (looking like Howard Hughes) of Howard Stark (Tony Stark’s father). Again, it’s a small role, but Cooper’s charisma helps bolster the role to being slightly memorable. Lastly, as I’m doing this review of the movie long after I’ve seeing (and I hope you guys have seeing it to), The First Avenger acts as the finale piece of the solo superhero origin feature films of the MCU’s Phase I initiative, setting things up for the first superhero team up in Marvel’s The Avengers movie and beyond. This including the “cube” or the “Tesseract” (its official namesake) as the first appearance of the Infinity Stones (a story thread that has spanned much of the MCU), the relationship between Captain America and comrade Bucky, which is felt more in The Winter Soldier and more presently in Civil War), and the appearance of Hydra, which echoes into several Phase II movies and other projects (Agents of S.H.I.E.L.D). Marvel’s iconic hero get his big screen debut in Captain America: The First Avenger. Johnston’s movie hits mark on telling how Steve Rogers became the first “Super Soldier” as well as crafting an intriguing movie world of mixing WWII and superhero frivolities. While there are some areas in which the film stumbles, its elevated by its cast and some good ol’ superhero fun from its comic book source material. To me, while it wasn’t as good as The Winter Soldier or presumably Civil War, it still was a good origin superhero story for Captain America and I do recommend it as a very satisfying Marvel film or superhero (remember Captain America: The First Avenger came out as the same here as Green Lantern and we all know how that superhero movie turned out to be). With this review done and complete (I already did my review for The Winter Soldier), now begins the thrilling start of Marvel’s Phase III sage with the highly anticipated Captain America: Civil War. Will Cap and Bucky make it out alive? Will have to wait and see.